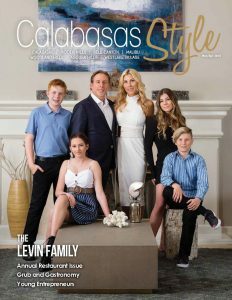 C Style: Christmas in L.A. | Calabasas Style Magazine C Style: Christmas in L.A.
C Style: Christmas in L.A. The holidays are a time to enjoy precious moments with family and friends, but all too often, we find ourselves stressed, rushing around, and not taking a moment to relax and reflect. So, I always make sure I plan ahead to schedule a free weekend on my calendar in order to put up seasonal home decorations. Because once the decorations are up, it can’t help but put you and your family in a blissful mood for the rest of the year. The good news is a few garlands of evergreens, a colorful wreath in the window, or an arrangement of candles flickering on the mantel can create just the right abundance of cheer needed. Here are some quick and easy ways to make your home festive. It’s difficult to overdo it on THE classic winter decoration—a fresh garland of evergreen. 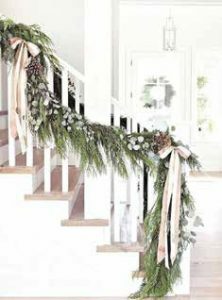 And there’s nothing like real garland to make a grand statement that the holiday season is upon us. So, if you do plan on adorning your home with fresh pine, the absolute best place to get mixed garland in bulk is downtown at the original Los Angeles Flower Market. I always get a few dozen yards, and Mellano & Co. is my secret stop and has miles of gorgeous garland, topiaries, wreaths, and more. My base decoration is the garland, and I layer onto it. I add visual interest by weaving in pine cones, strips of thick ribbon, or bright seasonal berries or little ornaments like wooden birds or brass bells. Decorating pine cones in sparkly paint and glitter is a fun craft for the kids too. Whether hung over doorways, draped between shelves or on the staircase, or wrapped around a dining table centerpiece or light fixture, there’s space for this fragrant favorite anywhere. bigger is better, like tall topiaries to the entrance of a room or a beautiful Santa or angel on a console. Collections work wonderfully. For instance, a client of mine has a beautiful collection of nutcrackers that we set out on and around the piano each year. Groupings of candles are great but again, using a more substantial sized candle will add a much more dramatic look. You’ll definitely want to work in and show off your special keepsake ornaments in a prominent place but add to them ornaments that follow one theme. Ornaments come in every shape and color but you don’t have to stick to the obvious holiday colors of red and green. Some of the prettiest trees I’ve seen are adorned in colors you wouldn’t expect, like blush, teal, and deep blue. One of my favorite places to find ornaments and holiday décor is the Aldik Home showroom in Van Nuys. Create your own holiday palette using hues already incorporated into your décor. Or for a neutral look, snowflakes made of glass or crystals don’t clash with anything and always add a noticeable wow. The key is cohesion. Establish a color theme and style by matching them to your China, table runner, or linens. For extra style points, swap out plain white candlesticks for a color that coordinates everything together cohesively. 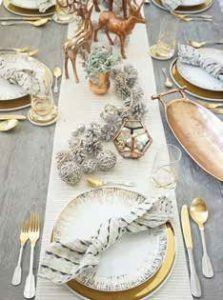 Use surfaces that catch the light—like mercury glass, silver, and gold. They are a gorgeous way to add some sparkle to a room and make the most of natural light. For centerpieces, use glass vases brimming with colorful glass balls or your extra ornaments. I love a natural look, and just by tucking in a pine cone here and olive or rosemary sprig there and using bowls of produce, like pomegranates and persimmons, items from nature create a beautiful look in addition to adding texture. And don’t forget the name cards. Get that host-of-the-year award by cutting gingerbread cookies into letters using alphabet cookie cutters and then put them at each place setting. 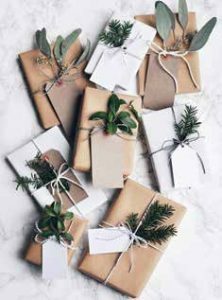 Since it’s the season of giving, for a contemporary look, wrap your gifts with craft paper with natural burlap ribbon and top them with a pretty piece of greenery. Or if glamour is more your style, pick up some stunning wallpaper to wrap your gifts with. Customize your gifts with mini square prints from socialprintstudio.com. Hole punch the corner and tie it to your ribbon. These work great for place settings as well!